Hugi has an audience with Ziphoid of SceneSat who, by the way, recently got married. Scenesat.com is the place that connects the many musical aspects of the scene to the rest of the world. SceneSat consists of a handful of people with some sort of background in the scene. Basically SceneSat started because we love the demoscene and all that comes with it, and that of course includes the musical part of it. SceneSat Radio aims to play the best music from every corner of the scene and related stuff. That would be game remixes, game soundtracks, demotracks, netlabels, tracks from music compos at demoparties, different platforms, etc. The music played here will be quality and not quantity. That means we will not have a rotation list containing 50.000 SIDs, 30.000 MODs, etc. SceneSat's goal is to make more people aware of the scene (just not Timbaland). There are just so many talented musicians in the scene that it would be a shame if they were only heard in the scene. You will not find a larger mass of musical talent anywhere else than in the scene. These artists make the music because they love it - not because they need to sell a album like the commercial mainstream artists - and you can hear that it is music made with soul. Computer music is NOT just bleeps and noise. It is just as good as commercial music and in some cases even better... and we will prove it. Just tune in and have a listen for yourself. In the period of writing this article Ziphoid of SceneSat got married. Hugi congratulates Ziphoid and his wife! Of course we wanted to know from Ziphoid how he looks back on his wedding day. Did any sceners attend your wedding? Any honeymoon trip soon? Ziphoid: "Well, to be honest, neither me nor my wife thought this would ever happen to any of us again, so we weren't really prepared for this. However, when we discussed the idea, we thought that it would actually be a very good thing to do, we went for it. It turned into a great day with a good amount of people present. It's always hard to know whom to invite to such an event, since we didn't want it to be TOO huge either. In the end, we went for mostly family but added a limited amount of friends, who we felt we really wanted to celebrate this day with. Not to say that we didn't want others to attend, but we had to draw the line somewhere. ...and of course, 95% of the friends invited were actually sceners... :) We're going on a delayed honeymoon trip this July, much in the line of our engagement trip last year, going to Scotland to drive around in the amazing scenery up there. :)"
February 2008 I was 'sacked' because of various reasons, mostly because I played more than just C64-related stuff. I had been in quite a lot of discussions with Hazel about the possibilities to start a more scene-centric station, or even sub-station to SLAY, and he had already started a little stream of his own called RadioFTV. When I told him that I had been dropped from SLAY, it felt like an easy choice to start something new since it was something we both wanted to do and we had the possibility to do so. I quickly discussed the technical requirements with my brother-in-arms fnord and the more 'commercial' aspects with truck and we just went for it. We had a first basic, but working stream just a week after that. We worked on the background systems and website for the coming year just to go live for real on the 7th of February 2009 with a big launch show aired from my place. We also released the compilation Sound of SceneSat vol 1 that night, which made it even more special." SceneSat is a brand in today's demoscene. But was the name SceneSat the original name from the beginning? Or were, perhaps, other names considered? Ziphoid explains: "The name was really bounced back and forth between us for a couple of days until we came up with Scene Satellite, which we really liked, even though it was a bit long, hence it felt natural to shorten it into SceneSat instead. Since our aim was to keep an eye on and report about the scene and its surroundings, it felt like an obvious choice. :)"
SceneSat is also known for streaming live video feeds from demoscene parties. We asked Ziphoid where this nice service began in the past and if parties are interested in a live scenesat video broadcast - what should the organisers do? Ziphoid: "Well, since we have been going to a lot of parties doing audio streaming, moving it to video was a natural choice, where the uplink allowed us to do so. If we can't come to a party for some reason, but they want to use our video streaming backbone, they can just contact us and we'll help setting things up. We can't send any hardware around for that, though, but at least we can support on the software side. :)"
people helping out. You can read the credits here. We asked Ziphoid about what it takes to maintain Scenesat and keep it running. Ziphoid: "At the moment, the website is quite derelict. I made it during the beta phase and it really hasn't been updated after that, apart from quite a lot of backend improvements to make it easier for us to manage the broadcasts. The current codebase is just one big hack, so I won't allow anyone to do anything with it, since they wouldn't understand it atm. However, a new site IS in progress and when that is released, more people will be able to help out since it will be a lot more structured and open source as well. :) Finance-wise, we're struggling. There really is no external funding more than the occasional donations (which at times have been VERY generous and extremely appreciated), but most of the software has been sorted by those. The video stream hosting is kindly donated to us by an anonymous benefactor in Denmark and then we have a few hosted relays from various people helping out, too. The main server is hosted in Stockholm and that renders an occasional cost every now and then, but mostly, I sort that out by helping the hosting company with some code jobs and similar. Travelling to parties are sadly mostly paid by ourselves, with a few exceptions. There aren't that many parties that can afford paying for our travels and accommodation, but at most of the parties, we're at least allowed in for free since we're helping out with the broadcasting. :)"
SceneSat has been streaming live from easter parties in the last years. Also from Revision 2014, which Ziphoid was not able to visit. (Unfortunately the SceneSat servers went down just before the PC demo competition at Revision 2014.) What role does Ziphoid have in the live streaming broadcasts? What does Ziphoid do behind the SceneSat curtains? "Me, fnord and truck went to the final Breakpoint in 2010 and helped out overlaying the video feed with our commentary. People really seemed to enjoy that and we really enjoyed working with the beam team, which made it a natural choice to jump on the train when we were asked to be part of the new Revision party. 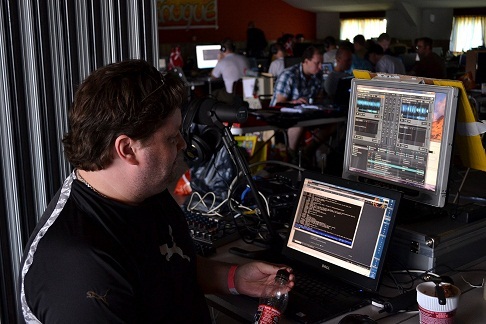 Also, since I had developed a close friendship with D-fox, one of the main organizers, I also became a member of the organizing team, helping out with both the website and the internal PartyMeister system. After the first year of a successful party broadcast, we felt we were doing something good for the demoscene by reporting from the biggest demoparty in the world and hence chose to be a permanent part of the organizing team", Ziphoid comments and continues: "This year, I sadly couldn't make it due to family priorities, but I tried to be part of the SceneSat family and help out as much as possible from home. That is also a quite tricky situation since the other staffers on location had to take a bit of a different approach to the streaming due to people expecting them to do some of the duties I was meant to take care of. I do think our staffers did a great job nevertheless but it felt a bit weird to be a sofa scener instead of actually being there. They had some struggle, though, with a dying video grabber card, an overdriven audio card and some other problems, but they managed to broadcast most of the weekend. During the big compo night on Sunday evening, the video server died for some unknown reason and since it was JUST too late to get hold of someone in Denmark who could restart it, the video streaming was switched over to UStream instead, which worked out pretty well. Streaming is never an easy thing to do, especially not when you're on a very limited budget. :)"
SceneSat even has its own musicdisk series called 'The Sound of Scenesat' from which Volume 2 was released on windows and featured a lot of musicians. How did The Sound of SceneSat project came to life? And why can't volume 1 be found on Pouet? Ziphoid: "The Sound of SceneSat compilations were something we came up with before our 'real' launch in 2009. We thought that we wanted to show the world what kind of music we were all about as well as giving them something amazing to enjoy. The first compilation was a true success with 54 tracks, totaling almost 4� hours worth of music. For the second compilation that we released two years later, at Revision, we decided to go for the music disk approach, as well as handing out the music in separate packages. For that one, we got a whopping 73 tracks, closing in on 6h12m of music, with a Windows based player interface as well. 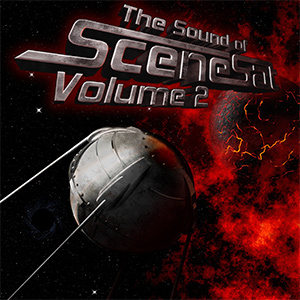 For the next volume (cleverly named Sound of SceneSat volume 3 ;)), we're moving into the next phase and will be providing both a Windows version as well as a browser based version. The compilations should not be seen as a limited set of productions, and we'll keep doing it for as long as people enjoy them. This time, we're also looking into the possibility of getting the tracks up onto Spotify, iTunes and other market sites. Not that we expect to make any money from it, but simply to make it easier to spread it around the world and get more people to appreciate the amazing music on there. :)"
The Sound of SceneSat volume 3 is almost finished. Unfortunately it won't make the Wild compo at the Outline party held in the same weekend as when I am finishing this article. But Ziphoid convinced me that the Windows version will be released this weekend anyway. 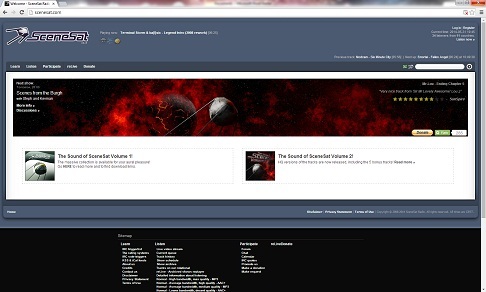 Asking about the development of the sound of SceneSat volume 3 Ziphoid commented: "Well, I could probably add something like 'The development of SoS3 has been a bit different'. The original plan was to release it at Revision 2013, but due to various reasons it was postponed and delayed. When we finally got going, we set quite a short deadline so we had our minds set at a smaller collection of tracks than before. We were wrong. Thanks to the great friends we have around the world, we've surpassed even the massive SoS2 and almost reached 90 tracks. It's nothing else but crazy, but still wonderful. There'll be tracks for everyone and not everyone (including me) will love every track, but the overall quality of the included tracks are nothing less than great. Right now, we're working our asses off to finalize it so we can release it to the world, and after that, we'll take a well-earned rest for a couple of days before we continue with more exciting projects that are just waiting to be unleashed on the world..."
SceneSat - The Future is Now! In Hugi's eyes SceneSat's future looks really bright. Ziphoid is part of a dedicated SceneSat team that wants to continue SceneSat and engage new SceneSat projects. How does Ziphoid himself look towards the future and what developments can the demoscene expect? "A complete rewrite of the website is in progress, and has been so for the last bunch of years. Due to limited time available, it always ends up taking much longer than we could hope for, but now it's at least on its way. We will do some major maintenance of the systems surrounding SceneSat during this coming summer, and hopefully that will mean that the process of development turns easier than what it is now. We are also looking into writing our own radio engine since the one we currently use (Spacial's SAM Broadcaster) simply doesn't work as we want it to and brings more limitations to the system than what we can live with. This will be done under our motto 'aaaaaany year now', though, so we're not really sure when we've reached that point. :) Overall, we're looking at making the system more connectable and interactive than what it is now and we're also opening up for deeper cooperation with other sites, like Demozoo and Exotica to make the visitor experience feel a lot smoother", Ziphoid explains and concludes: "What we are aiming to do in the future is to keep entertaining ourselves and our viewers/listeners pretty much like we have done for the last six years. We will keep develop our systems and try to be present at more and more parties to report back to the people who cannot attend themselves, for whatever reason. Two things that limit our capabilities to do this are very simple, but nevertheless very hard to solve. Time and money. We are only humans and we do have our daily lives to manage and with basically no funding, it's really hard to make everything we want to do. We do occasionally get some highly appreciated donations and we have very kind and powerful hosting of both audio and video bandwidth, but the funding is simply not enough to do everything. One plan we have in the future is to make more target-based 'donation runs', in some sort of Kickstarter fashion (albeit not by using Kickstarter, of course) to help us achieve certain goals we set up. We're not really certain of what kind of goals those will be yet, but that will come naturally as we are evolving. A major rewrite of our management system is in the works already, but we're aiming to create our own (or find one that suits us better than the current solution, which is a commercial product called SAM Broadcaster) streaming solution. It all really is up to time and resources and if someone wants to help out, feel free to howl to us. :) We are also opening up our system more to connect to other systems, like DemoZoo and others, to give people a more connected experience to get information about the demoscene, as well as reaching out through more channels to gain a bigger audience. Not particularly for us, but for the demoscene as a whole. I do believe that is part of what we must do to make the scene survive and expand."